I thought that I should say thank you. I have enjoyed reading your many articles on EHR Design. It amazes me how little effort in software design gives any consideration to Human Factors. Bravo. Hit the large and proximal nail right on the head. Great item made all the better by the real time exercise. “The choice of touch screen technology and large icons deserves some comment. A major motivation for using a structured data entry approach is not just to obtain structured data but also to increase the speed of data entry. Fitts’s Law  is a mathematical model of time to hit a target. It basically says that larger targets are easier, and faster, to hit. Fitts’s Law seems obvious, but it is often ignored when designing electronic patient record screens because the larger the average icon, button, scrollbar, etc., the fewer such objects can be placed on a single screen. A natural inclination is to display as much information as possible; EPR screens are thus often crowded with hard-to-hit targets, slowing the user rates of data entry and increasing associated error rates. Fitts’s Law, in conjunction with constrained screen “real estate,” suggests use of a few, large user-selectable targets. Displaying fewer rather than many selectable items tends to increase the number of navigational steps, unless some approach is used–such as a workflow system–that automatically and intelligently presents only the right structured data entry screens. Only now, due to influence of smartphone and tablet user design, are we beginning to see these ideas (minus the workflow, but that will come too) applied to EHR design. And target for my doggerel wit. Thanks so much for your comments! It’s great to get your feedback. When I’m writing these posts and even after they’re published, it often feels like I’m working in a vacuum, so your input means a lot to me. I know that Mr. H, Inga, and Dr. Jayne equally appreciate comments to their posts. Thanks again for taking the time to post your comments! It’s not clear to me that EHR user interfaces based on touch screen technology are necessarily the optimal design solution in all cases. In fact, I don’t think that any particular platform is optimal for all EHR-related tasks. In my next post, I am going to propose, for discussion and debate, a single-screen design for a patient encounter that requires a large high-resolution monitor for the display and a mouse (plus possibly a keypad) as the input device. I look forward very much to your thoughts and comments. Indeed, every CPOE and EMR device out there circa 2012 are cognitive disrupters because of interfaces that do not meet the standards so aptly described in this report. Thanks for clearly stating the problem afflicting a rather quick thinking group of professionals. Keep up the great posts. I have been introducing User Experience to my company since the beginning of the year. I have found your EHR Design Talks to be one of the better education tools that I can share with the rest of my colleagues. And it’s been a great review for this experienced Designer. What I wrote then, is now over a decade old. It was true at the time. Keep it up! Enjoy your posts. Chuck, I’m a huge fan of speech recognition technology. In my opinion, we have not yet taken full advantage of the potential of speech recognition technology and especially of natural language processing to improve our clinical care. Nice post as always. I’m not sure this is the best measurement of Fitz Law, although much of the law seems obvious (as many do once they are written down). My score was very linear, which I attribute to the repetitiveness of the task (“left-right-left-right”) and years of honing my mouse skills playing Half Life. More interesting, I found myself thinking about how the user interface tools are easily optimized to the task at hand. 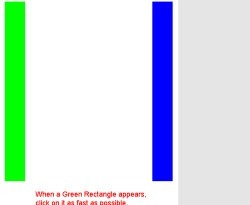 Imagine if moving a mouse would jump very quickly to a different region of am observable rectangle. Given that the task at hand was to click on rectangles, it makes no sense to use a general purpose pointing device and not a UI gesture system optimized to clicking on somewhat randomly appearing rectangles. So while the obvious “moving far and to smaller areas” observation is somewhat trivial, the real issue is why are we trying to use a user environment optimized for dragging hard drive files for healthcare data entry. As Dr. Webster points out above, aren’t we way past Windows 95 as the metaphor for healthcare data? Why aren’t we even questioning the concept of asking physicians for discrete data entry when they all know the original data of medicine is their observations and opinions expressed in their natural language? We have technology to let the physicians record data the way they think and translate it into the interoperable data for our big lumpy computers. How did we get to this paradigm of electronic medical records being the origin of data and not the repository of data from systems optimized for the facility/specialty/procedure in use? Someone kick out these engineers and get a doctor in the house! One clarification: Even though it appeared that your score was very linear, the second graph in the online demo (using Fitts’ formula) plots a logarithmic function, so if I correctly understand what you mean by linear, Fitts’ Law fits. Your points are very interesting. I have been thinking about whether the buttons on a numeric keypad could be used instead of a mouse for high-level navigation. For instance, suppose your screen is divided into a 3×3 grid of panes, each pane containing a different category of EHR data. Then the layout of the keys (1through 9) on numeric keypad would map nicely to this 3×3 grid of panes. You could expand a pane merely by pressing the corresponding key with your non-mouse hand and then use the mouse for finer levels of query. While speech recognition technology, hand-writing technology, and keyboard data entry, to a greater or lesser extent, all allow physicians to record data they way they think, translating such natural language into discrete data remains a challenging task. I couldn’t agree more that only natural language can provide physicians with the clarity of thinking needed for good clinical judgment. Finally, I happen to think that both engineers and doctors are indispensable, but that we need to get an interaction designer in the house!